Yesterday you saw how my closet went from a disaster to an organized space. Today I thought I’d share some of my favorite closet organizing tips with you, as well as some photos to inspire your closet designs. If organizing wisdom is true, we wear 20% of our clothes 80% of the time. Make sure that your closet is not packed with the 80% that you don’t wear or use. The clothes in your closet should be easy to access and able to be mixed and matched with each other so that your entire wardrobe is being used. What is in your closet to should be ready to wear at all times. That means your clothes should be clean and ironed and your shoes should be free of dirt and polished. 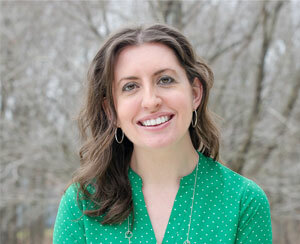 It is so much easier to throw together a great outfit if everything is ready to go. 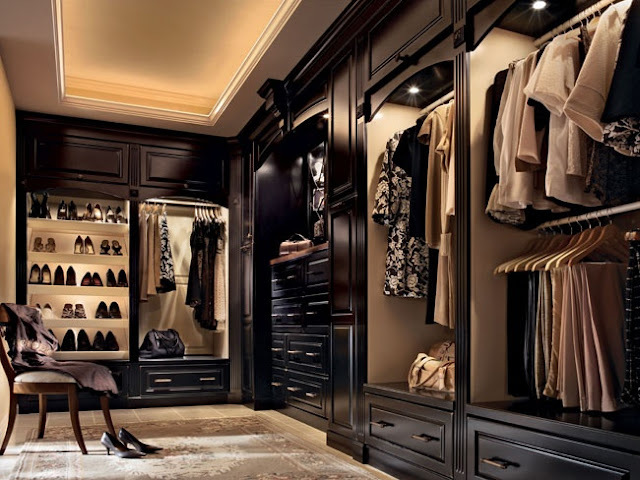 If your closet area is dark, try installing some sort of light, even if it is just a LED touch lamp. Colors look differently in darker rooms and it is much harder to find what you are looking for if you can’t see correctly. Reexamine your closet about every six months, ideally in the spring and fall when you’d be switching out your seasonal clothes. 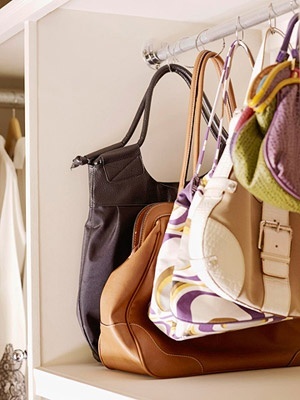 This keeps clutter from building up and your closet becoming disorganized. Use every square inch of your closet, floor to ceiling. This doesn’t mean you have to go out and buy a fancy shelving system, though. I created my own using crates and foam board. Don’t forget about that space behind your hanging clothes for things you don’t need to access to everyday. And remember that the floor can be used to store things like shoes, your hamper, or baskets. Search sites like IKEA, Home Depot, Lowes, and of course, Pinterest for ideas about how to “construct” your closet. You don’t actually have to build something or spend a ton of money to get a closet that works for you, though. Use the inspiration to find things you can adapt. You may need to add a double rod, some more shelves, or just add baskets. What works for one person will not work for everyone. I like to have all my shoes out and displayed, but other people prefer to have their shoes in boxes or cubbies. Find what works for you. You should have matching hangers. Mine are wooden, and while they take up more space than traditional hangers, it does ensure my clothes aren’t crammed into my closet. (Just because the hangers all fit, doesn’t mean that you don’t have too many clothes in there!!!) There are also a lot of huggable hangers out there now that maximize your space and help to keep things from sliding off the hanger. They even make nice ones that hang multiple pair of pants . Having the hangers all match give the entire closet a cleaner look. 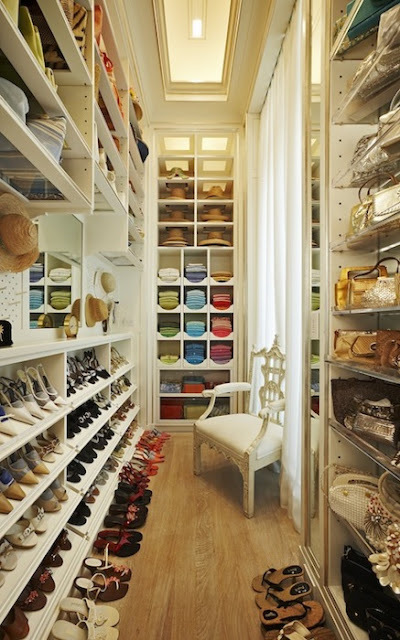 Make your closet a bright, cheerful space. Add special little touches like shelf paper, a pop of color in paint, even a pin board to tack up photos of outfits you might like to recreate. Your closet should feel like your own fancy little boutique when you open the doors. 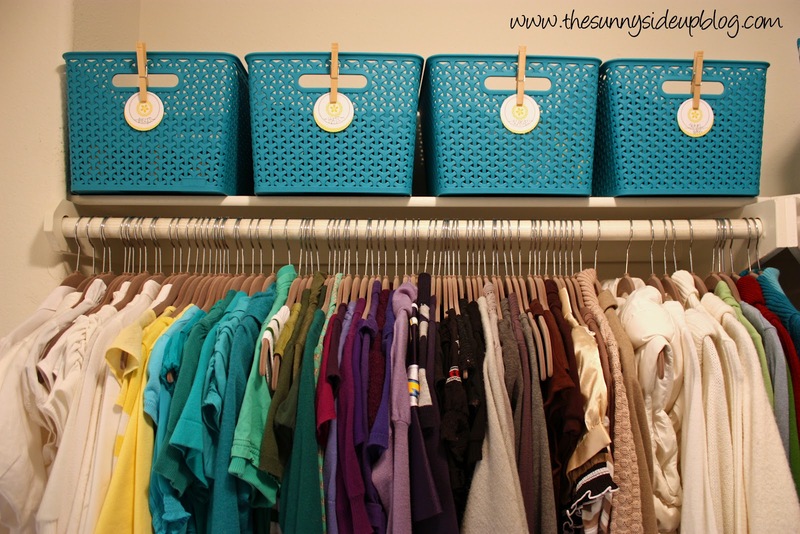 Organize what is in your closet by color. This makes looking into the space seem so much more organized and helps you to find things that go together easily. Use baskets to store smaller items in your closet, like scarves, belts, and ties. The baskets keep everything from getting lost and are another thing that can add that special touch to your closet. I hope you got some good ideas from all of these pictures for your closet designs. What other ideas have you come up with?